Sony Michel (born February 17, 1995) is an American football running back for the New England Patriots of the National Football League (NFL). He played college football at Georgia. Michel's parents emigrated from Haiti a year after his older sister Lamise was born. Michel attended American Heritage School in Plantation, Florida. Michel was the starting running back for the American Heritage Patriots, beginning in his eighth grade year there. As a senior, he rushed for 1,833 yards and 24 touchdowns. Over three years playing on varsity, he rushed for 4,758 yards and 63 touchdowns. He was rated by Rivals.com as a five-star recruit and was ranked as the third best running back and 13th best player overall. Michel committed to the University of Georgia on April 26, 2013 to play college football. Michel's older brother Marken Michel is a receiver for the Philadelphia Eagles of the National Football League, and was the 2017 West Division Most Outstanding Rookie with the Calgary Stampeders of the Canadian Football League. Michel also competed in track and field at American Heritage; as a sophomore in 2011, he earned first-place finishes in both the 100-meter dash (10.99s) and 200-meter dash (21.91s) at the FHSAA 2A District Meet. He posted a personal-best time of seconds in the 100-meter dash at the 3rd Annual Miramar Invitational, where he placed first. As a true freshman at Georgia in 2014, Michel played in eight games and made one start. He missed five games due to a fractured shoulder blade. He rushed for 410 yards on 64 carries with five rushing touchdowns. Michel entered 2015 as a backup to Nick Chubb, but earned extensive playing time. After Chubb was injured in a game against the Tennessee Volunteers, Michel took over as the starter and ran for 145 yards. In the 2016 season, Michel totaled 840 rushing yards and four rushing touchdowns to go along with 22 receptions for 149 receiving yards and a receiving touchdown. In 2017, with true freshman Jake Fromm starting at quarterback for the Bulldogs, the team relied heavily on its senior running backs, Chubb and Michel, to carry the load. Despite remaining second in the depth chart behind Chubb, and receiving only two-thirds as many carries as Chubb, Michel had a breakout year, finishing with 1,227 rushing yards (156 carries), only 118 yards fewer than Chubb's 1,345 (223 carries). In a blowout game against Vanderbilt on October 7, Michel rushed for 150 yards and a score on only 12 carries. Three weeks later, in an October 28 rout of Florida, Michel rushed for 137 yards on only 6 carries, scoring twice on runs of 74 yards and 45 yards. Michel's biggest game of the year came on New Year's Day against Oklahoma in the Rose Bowl, Georgia's first-ever College Football Playoff game. Carrying the ball only 11 times, Michel ran for 181 yards and three touchdowns, including a walk-off 27-yard rushing touchdown from the "Wild Dawg" formation (direct snap to Michel) to end the game in double overtime. He also added four receptions for 41 yards and a fourth touchdown. For his performance, Michel was named Rose Bowl Offensive MVP. Chubb and Michel's 326 combined rushing yards in the Rose Bowl put them at 8,259 career rushing yards, surpassing Eric Dickerson and Craig James' FBS record of 8,192. Michel was selected by the New England Patriots in the first round of the 2018 NFL Draft with the 31st overall pick. He was the third running back to be selected that year. In addition, he was the third of six Georgia Bulldogs to be selected that year. Michel & Isaiah Wynn were the first pair of college teammates selected by the same team in the first round since Auburn players Jason Campbell and Carlos Rogers were taken in the 2005 NFL Draft by the Washington Redskins. Michel suffered a knee injury in training camp causing him to miss the entire preseason. Michel made his NFL debut in Week 2, against the Jacksonville Jaguars, running the ball 10 times for 34 yards in the 31–20 loss; he also had a six-yard reception. In a Week 4 victory over the Miami Dolphins, Michel had a breakout game with 26 carries for 112 yards and a touchdown. He became the first rookie to top 100 rushing yards in a game for the Patriots since Brandon Bolden in 2012. In a Week 5 victory over the Indianapolis Colts, Michel rushed for 98 yards and a touchdown. In Week 6 against the Kansas City Chiefs, he had 106 rushing yards and two rushing touchdowns in the 43–40 victory on Sunday Night Football. He became the first New England rookie to score on the ground twice in a game since Laurence Maroney in 2006. On November 25, Michel ran for a career-high 133 yards and a score against the New York Jets, the most rushing yards by a Patriot rookie since Bolden ran for 137 yards in 2012. This game was his third time breaking the century mark, making him the first Patriots rookie since Robert Edwards did so in 1998. In Week 16, against the Buffalo Bills, he had 18 carries for 116 rushing yards and a rushing touchdown. Overall, he finished his rookie season with 931 rushing yards and six rushing touchdowns. The Patriots won the AFC East and earned the No. 2 seed for the AFC Playoffs. In the Divisional Round against the Los Angeles Chargers, he had 24 carries for 129 rushing yards and three rushing touchdowns in the 41–28 victory. During the AFC Championship against the Kansas City Chiefs, he had 29 carries for 113 rushing yards and two rushing touchdowns in the 37–31 overtime victory. Michel broke the NFL record for most playoff rushing touchdowns for a rookie, scoring five between the divisional and conference championship games. On February 3, 2019, Michel scored the lone touchdown in Super Bowl LIII against the Los Angeles Rams, carrying 18 times for a game-leading 94 yards. The go-ahead touchdown occurred late in the fourth quarter in the 13–3 victory. He was the leading rusher in the game and extended his rookie postseason rushing record to six touchdowns, the same number of touchdowns he scored in the 13 games played in the regular season. ^ Press, ed. (October 8, 2015). "Sony Michel: Born To Play". Georgia Dogs. Retrieved August 12, 2017. ^ Furones, David. "American Heritage standout Sony Michel selected by Patriots in first round". Los Angeles Times. Retrieved October 3, 2018. ^ Furones, David. "American Heritage standout Sony Michel selected by Patriots in first round". Sun-Sentinel.com. Retrieved November 2, 2018. ^ "Georgia adds No. 2 RB Michel to backfield". ESPN.com. ^ "American Heritage RB Sony Michel commits to Georgia". Sun-Sentinel. Retrieved October 3, 2018. ^ "Shaw CFL Awards Reel: Most Outstanding Rookie – CFL.ca". CLF.ca. ^ "FHSAA 2A District 14 Championships – Day 1 – Track & Field Meet". Athletic.net. 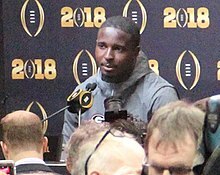 ^ "Georgia's Sony Michel confirms twice fractured shoulder blade, but now healthy". Macon.com. ^ Paschall, David. "Georgia's Sony Michel hoping for healthier second season". Times Free Press. ^ Ching, David. "Georgia's Sony Michel more than just Nick Chubb's backup". ESPN.com. ^ Riley, Connor. "Georgia figuring out ways to get Sony Michel on the field". Savannah Now. ^ "UGA RB Sony Michel carries the load at Tennessee, but fumble haunts him". Online Athens. ^ "Sony Michel 2016 Game Log". College Football at Sports-Reference.com. Retrieved October 29, 2018. ^ "Georgia vs. Vanderbilt – Game Recap – October 7, 2017 – ESPN". ESPN.com. Retrieved January 10, 2018. ^ "Georgia vs. Florida – Game Recap – October 28, 2017 – ESPN". ESPN.com. Retrieved January 10, 2018. ^ "Georgia vs. Oklahoma – Game Recap – January 1, 2018 – ESPN". ESPN.com. Retrieved January 10, 2018. ^ "Georgia survives Oklahoma in classic, back-and-forth Rose Bowl in double overtime". USA TODAY. Retrieved January 10, 2018. ^ "Georgia's Nick Chubb, Sony Michel surpass FBS rushing record in Rose Bowl win". CBSSports.com. Retrieved January 10, 2018. ^ "NFL Draft Prospect Profile – Sony Michel". nfl.com. March 1, 2018. Retrieved March 1, 2018. ^ "Georgia RB Sony Michel : 2018 NFL Draft Scout Player Profile". NFLDraftScout.com. Retrieved May 12, 2018. ^ Sessler, Marc (April 26, 2018). "Patriots bolster offense with electric RB Sony Michel". NFL.com. ^ "2018 NFL Draft Listing". Pro-Football-Reference.com. Retrieved October 3, 2018. ^ "Six Bulldogs Selected in 2018 NFL Draft". University of Georgia. Retrieved November 2, 2018. ^ Quinn, Sam (April 26, 2018). "Sony Michel, Isaiah Wynn building Georgia to Patriots pipeline". 24/7 Sports. ^ Fox, Tanya Ray (August 17, 2018). "Report: Sony Michel's procedure was due to a meniscus issue". Patriots Wire. Retrieved September 17, 2018. ^ "Patriots Fall To Jaguars 31–20". September 16, 2018. Retrieved January 22, 2019. ^ Dunphy, Mark (September 30, 2018). "After his 112-yard breakout performance, Sony Michel can 'pretty much do it all'". Boston.com. Retrieved October 3, 2018. ^ Ventura, Dan (September 30, 2018). "Patriots rookie RB Sony Michel enjoys breakout game". Boston Herald. ^ Clements, Devon (October 5, 2018). "Sony Michel already racking up Patriots' rookie milestones". USA Today. Retrieved October 10, 2018. ^ Princiotti, Nora. "The Chiefs left too much time, and Tom Brady did what Tom Brady has always done". BostonGlobe.com. Retrieved October 29, 2018. ^ Clements, Devon (October 15, 2018). "Instant analysis of Patriots' 43–40 shootout win over Chiefs on SNF". Patriots Wire. ^ Scalavino, Erik (November 25, 2018). "Game Recap: Reasons to be thankful". Patriots.com. Retrieved March 25, 2019. ^ "Game Notes: Patriots register 18th straight season with at least a .500 record". Patriots.com. November 25, 2018. ^ "Buffalo Bills at New England Patriots – December 23rd, 2018". Pro-Football-Reference.com. Retrieved January 30, 2019. ^ "Sony Michel 2018 Game Log". Pro-Football-Reference.com. Retrieved January 30, 2019. ^ "2018 New England Patriots Statistics & Players". Pro-Football-Reference.com. Retrieved January 30, 2019. ^ Thompson, Rich (January 13, 2019). "Rookie Sony Michel powers Patriots past Chargers". Boston Herald. Retrieved January 30, 2019. ^ Perry, Phil (January 21, 2019). "Patriots go on the run to extend their run". NBC Sports Boston. Retrieved January 30, 2019. ^ Bratton, Michael Wayne (January 21, 2019). "Sony Michel has already set rookie rushing touchdown mark in NFL postseason history". Saturday Down South. Retrieved January 30, 2019. ^ Wesseling, Chris. "New England Patriots win Super Bowl LIII". NFL. Retrieved February 3, 2019. ^ "Super Bowl 53: UGA's Sony Michel sets rookie postseason TD record". The Atlanta Journal-Constitution. Retrieved March 25, 2019.